What is your favorite one-word titled Best Picture winner? 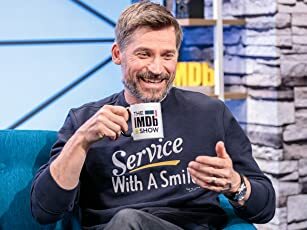 Proximo: I know that you are a man of your word, General. I know that you would die for honor, for Rome, for the memory of your ancestors. But as for me? I'm an entertainer. A few new shots of Commodus riding to meet his father along with his entourage. New footage of Maximus riding to flank the Germanians. A whole Alternate Sequence of the Death of Maximus's Wife and Son. In this version we see him ride through many different scenes and he overlooks the farm seeing his son getting trampled by horses and his wife screaming. He screams and he reaches forward with his open hand. He pulls it back and there is blood. He cries out loud in pain over the death of his family. New footage of the Arabs and the Gladiator Training Grounds. Commodus not-so-warm reception in Rome. We see people graffiting his name on walls. New footage of the first Gladiator Chain-Gang battle. We see an Alternate Take of Hagen impaling the man on a spike protruding from a wall. We also see that after the battle is over, a huge man wearing a mask walks out and kills the wounded. Hagan in a bath accompained by exotic women. Germanian Ground Battle footage of Maximus fighting of many Germanians! Q: What is Maximus's war ritual, i.e., rubbing his hands with dirt, and why does he use it? Q: Why are Juba and Maximus marked with red and yellow paint on their chests when fighting Hagen? Q: Isn't Maximus' accent a bit "off", compared to the other characters'? 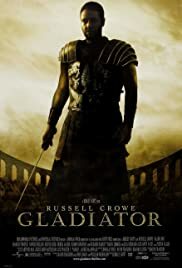 I love history, and to me, Gladiator is a masterpiece. It is the most accurate picture of the Roman Empire Hollywood has ever put out. People declare Spartacus a masterpiece, but Gladiator far outdoes Spartacus in quality. 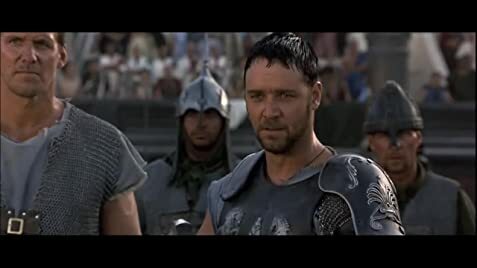 The costuming, the acting, the screenplay, the scenery, and the fighting styles made me think that I had traveled back to 180 A.D. Russell Crowe is a true Hollywood tough guy, and he is superb in this movie. Joaquin Phoenix is outstanding as a villain, one of the best in movie history. He played his character as if it were a psychologist's dream case. Connie Nielsen plays one of the strongest female characters that I have ever seen. The choreographer of the action sequences was brilliant. Ridley Scott did an outstanding job in recreating the Empire, including the multitude of ethnic groups within the Empire and accurately depicting everyday life. If you're looking for insight into what the Roman Empire was like, this is a perfect depiction. 244 of 351 people found this review helpful. Was this review helpful to you?